Purchasing a large quantity of pork stocks your freezer and provides you with the convenience of farm fresh meat for quick meal preparation without having to venture to the grocery store. Buying Bulk Pork also saves you money. The larger the pork share, the more money you save. How is our pork priced? 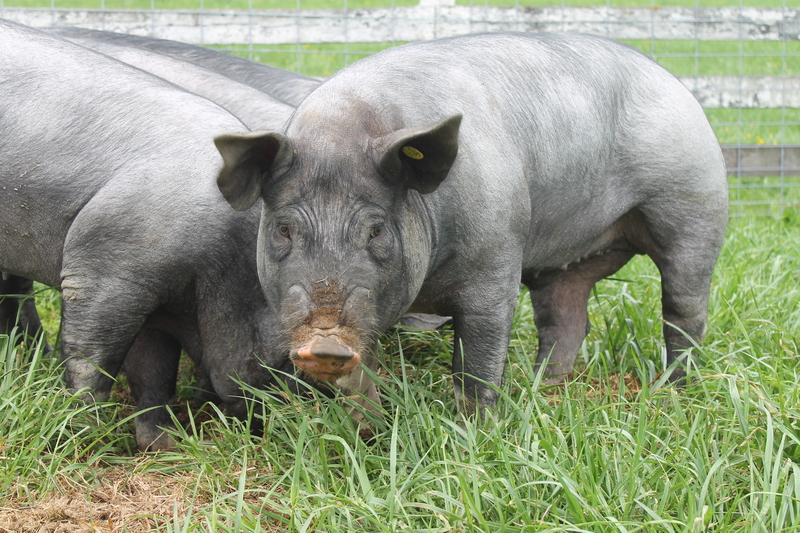 Our pork is sold based on the Hot Carcass Weight (HCW). HCW is the weight of the animal after removing a lot of the parts that aren’t edible, but before being made into finished cuts. Our prices INCLUDE the cost of processing and pick up from the processor. If you purchase a whole share or half share, you may opt to customize your cut sheet- this includes selecting the type of cuts you desire, chop thickness, sausage flavors, roast weight, and many more options. The cost below includes sausage in 1 lb vacuum sealed packs and smoke cured bacon. If you desire links or smoking of hocks and hams, additional charges apply. You will be charged the below pricing based on HCW and then you will pay the difference in finer processing at the time of pork pick up. Whole: $3.75/lb (Est. HCW of 200 lbs). Cost Est. $750 for about 100 lbs. of pork once packaged. Half: $4.00/lb (Est. HCW of 100). Cost Est. $400 for about 50 lbs. of pork once packaged. Below are general figures on typical cuts from a half pork based on the Beef and Pork Whole Animal Buying Guide from Iowa State University. Please keep in mind that most cuts of pork can be changed per bulk pork order. If you have any questions about the availability of a certain cut of pork, please let us know! Do you need to invest in a freezer? As a general guide, 50 pounds of meat will fit in about 2.25 cu.ft. of cooler/freezer space. The empty freezer compartment of a new, average-size, home refrigerator is about 4.8 cu.ft. A Half share should fit in your kitchen freezer with a small amount of space to spare. If you are interested in buying Bulk Pork, please email us so we can assist you in selecting the right quantity for your needs or freezer space. We will guide you through the process of completing a cut sheet if you opt to purchase a whole pork share. We are currently accepting deposits for Bulk Pork available Summer 2017. Deposits are non-refundable.